You can see my original thoughts on this book in this post. Since this novel is not set in the Cruel Beauty universe but is similar in feel to Cruel Beauty, I figured that I would expand on the similarities and differences between the two novels so that if you have tried and disliked Rosamund Hodge's debut, you might give her work another chance; and if you haven't read Cruel Beauty, or have and loved it, you'll be intrigued by the promise of Crimson Bound. A.) Both protagonists have severe destinies and not so optimistic looks on life. Both have grown up believing that they've been doomed to death, and both of their character growths involve redemption of some sort: whether for themselves or the fate they have been dealt and now must accept. B.) Both have similar love triangles, where there is obviously a good romantic interest who sees her as she is and challenges her, and a bad romantic interest who highlights the good in the other because he sees the MC for how he wants her to be. The ideal vs. the reality; one a well-realized, well-developed character who's a foil to the real romantic interest. C.) Both have other stories, fairy tales, woven into their plotlines. In Cruel Beauty, we were told all about the demons and the great kings like Claudius who came before the Gentle Lord assumed responsibility. In Crimson Bound, we are told of a brother and sister fighting the forestborn, a story which, as in Cruel Beauty, may prove to hold the key for how the MC should proceed. D.) Both have fairy tale like elements. Both are inspired by popular fairy tales and thus have elements like enchanted castles that hide secrets. A choice or event that lead the heroine down her main dark path - one she has never particularly liked nor understood. In Crimson Bound, Arthurian elements like swords and enchanted forests. E.) Both are not true fairy tale retellings. Both books are inspired by fairy tales, but definitely do not follow the same plot events of their inspiration. A.) Less Romance -- or the romance seems to get less focus. Maybe this one is just my perception, but Crimson Bound seems to have more focus on Rachelle's character development and more cinematic action scenes than Cruel Beauty despite a large portion of the plot, in both, occurring in castles. Perhaps this is because Cruel Beauty had Nyx married and in the same place, at all times, as her romantic interests... and in Crimson Bound, Rachelle is more focused on her duty and wondering whether she can trust anyone at all with her task besides herself. B.) Point of view -- Crimson Bound is a departure from Cruel Beauty because it is no longer told in first person but becomes more distanced with third person past. This will probably work better for the people who did not, unlike me, like Nyx as a character. The distance might then allow them to connect better to Rachelle as a character. C.) Magic System vs. Magic Creatures -- In Cruel Beauty, Nyx is taught the Hermetic arts, a magic system. In Crimson Bound, Rachelle must understand the inner workings of the Forestborn, immortal magical creatures with fierce strength and speed. For people who did not like the magic system in Cruel Beauty, perhaps this is a better alternative for them. D.) Villains -- Crimson Bound seems to have a lot more direct villains than Cruel Beauty did. These villains factor directly into the climax and other action in the novel whereas the evil forces at be in Cruel Beauty seemed more like distant antagonists who weren't characters so much as forces. E.) Comparisons -- Cruel Beauty was marketed as Graceling or Greek Mythology meets Beauty and the Beast. Crimson Bound, per the author's description in the acknowledgements, is something like a 17th (?) century France meets Little Red Riding Hood meets the Maiden with No Hands. Regardless, Rosamund Hodge astounds me with her talent at creating complex characters and character relationships alongside some seriously cool plot twists. If you like the religious/saint/Apparat element in the Grisha trilogy; the romance dynamic in Cruel Beauty; the discussion of what makes a monster in Graceling or the half-dragon worries in Seraphina; the bodyguard-angel dynamic of damphirs-Moroi from Richelle Mead; or the Arthurian like quest in the Raven Boys, you'll find that and more in Hodge's intricate mythology. 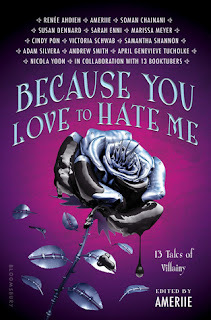 Just as I did with Cruel Beauty, I have made a lot of comparisons here because both books have struck me with that sense of universal appeal, where I do in fact think that they will generate a huge readership among already existing fanbases. And why not, with the layered feel of Rosamund's writing and world. I admire her talent greatly, and I hope that you'll give her books a shot. i fairly enjoyed cruel beauty and want to give crimson bound a chance. Glad to know there is less focus on the romance than in her first book because there was too much of that there. Well, as you know, I didn't like Crimson Bound much and prefer Cruel Beauty. I wonder now, reading your review, if part of the difference isn't related to the difference in plots. Crimson Bound is very much about villains and heroes, whereas Cruel Beauty focuses more on the good and bad within individuals. I think the latter appealed to me more. Nice review. 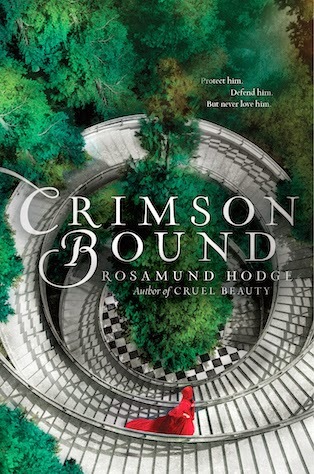 I very much enjoyed both of the author's books - I will say that for Crimson Bound, I did find it a bit hard to follow the plot in terms of the brother/sister myth that popped up every few chapters. But the writing was beautifully evocative. Ah, I loved the romance in Cruel Beauty, so I might disagree on that :P. But I'm glad you'll give Crimson Bound a chance! Ha, I prefer Cruel Beauty too. That is a really good summary of the difference in plots, and also a good summary of why I like Cruel Beauty more as well (and I guess why there's more romance - easier to use that as a device in the morality within an individual vs. on a grander scale). Ah, yes, the brother/sister story threads sometimes did confuse me because I wasn't sure where things would go from there - but I did like how the author twined those threads back into the story. I'd agree that the writing was very evocative as well :). I'm glad you liked both books! Why thanks. I also think the romance in Cruel Beauty was more fleshed out. She had a lot more room to work with. It seems that people really lean towards one of the novels more than the other. Kara liked this one more, but the first one was more popular with my other co-blogger. I'm going to be very curious on comparing the two. And if there is less romance, then I am all for that! I'd agree. I don't think it's a polarizing difference because these books are clearly produced by Rosamund Hodge (very distinct signature) -- but I would say that they are feeding into different sorts of concerns for readers. Maybe Crimson Bound was an attempt to be more adventure oriented, less romance because some people, like you, didn't like that as much in Cruel Beauty. I hope you end up liking Crimson Bound! I liked Cruel Beauty and have this one in my TBR pile so I found your comparisons pretty helpful, Christina. I had no idea that this one also has a love triangle so it's good that there's less romance. But, it's from a third person perspective whereas I prefer first person. I will read Crimson Bound though because I'm a huge fan of fairy tales and like that some have served as inspiration for it. Yay! I'm glad you found them useful. If the love triangle in Cruel Beauty didn't bother you overly so, then I don't think this one will either. Plus, the less romance, more focus on the main character's mission and growth (I wonder if that's because with third person, the author felt she had to be more explicit more about it vs. first person?). I hope you enjoy Crimson Bound!